Armed with practical skills and experience to design creative solutions to entrenched social problems, a CQUniversity graduate is a life-long changemaker, whatever their career, and wherever they live. 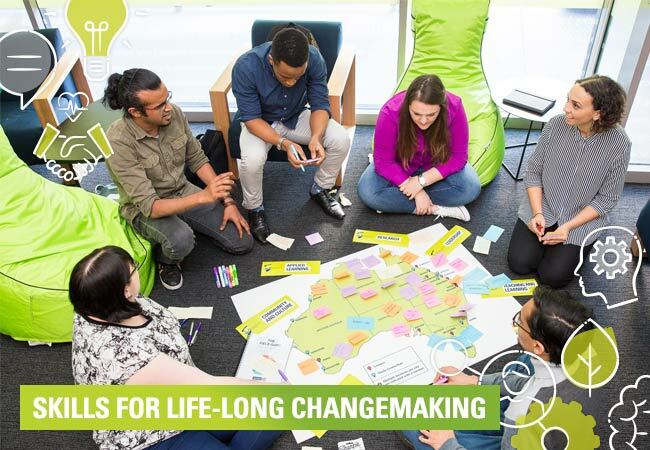 Since 2018, new and current students have been given the opportunity to begin their social innovation journey with iChange® – an orientation program to activate changemaking at CQUniversity. This fast-paced, fun and informative program shares inspiring stories of transformative change and equips students with tools, networks and creative ideas to drive social innovation in their lives and communities. Students can also get practical experience through elective and extracurricular initiatives, including the Social Innovation Studio, The Big Idea social enterprise competition, CQUGlobal Outbound opportunities, and the Social Innovation Lecture Series. Passionate student changemakers also have regular opportunities to apply for Change Champion roles within the Office of Social Innovation and participate in on-campus social innovation clubs. CQUni students can also get qualifications to support their changemaking, with a post-graduate qualification in Social Innovation. Finally, students making a difference through social innovation can nominate for the annual CQUniversity Opal Awards, in the Social Innovation category. CQUniversity designs all student social innovation opportunities to ensure they are real-world relevant and boost employability and practical experience for our graduates. Keep an eye on the weekly Student Broadcast Email to get involved in social innovation at CQUniversity, or email socialinnovation@cqu.edu.au with ideas to activate change on your campus. iChange@ is a fast-paced, fun and informative orientation program to activate changemaking at CQUniversity. The Big Idea is a national social enterprise competition between students at participating universities. Find out more and get involved. The Festival of Change is an annual multi-campus event celebrating and bringing to life changemaking at CQUniversity. CQUGlobal exchange programs offer enormous opportunities for inbound and outbound students wanting to explore other cultures.